Celebrations for Easter Triduum in Umbria are several, encompass and involve different spots, from the small mountain village to the main town. Everywhere in the region, you could participate to unique as well as particular religious and not religious rites, deeply rooted in the past of the area. The Holy Thursday is the day when Jesus’ Last Supper and his prayer on the Getsemani’s mountain is recalled: the Chrism’s Solemn Mass will be celebrated in Assisi and there will be a blessing of the Holy Oils that will be used to celebrate sacraments during the year. In the evening, after the first mass of Easter Triduum, worshippers will visit the several churches of Assisi to pray in presence of the Blessed Sacrament. Later, recalling the ancient 14th century Scavigliazione’s lauda, the ceremony of Christ’s Deposition will take place in Assisi. On Friday morning, if you’ll stay in Assisi, you will be able to participate to the procession during which the Dead Christ’s Statue will be moved from the St. Rufin’s Cathedral to St. Francis’ Basilica, through intermediate stages in enclosed monasteries. In the Holy Friday’s evening people will pray in Assisi during the historical and inspiring procession of the dead Christ: a procession accompanied by torches which will see the participation of all Assisi’s brotherhoods. The parade will start from St. Rufin’s Cathedral just with the Lady of Sorrows’ statue. 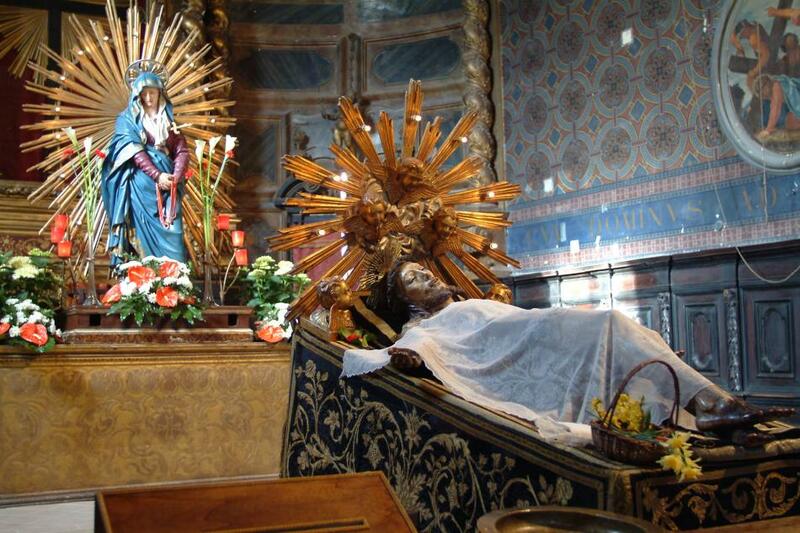 After the stage in the St. Francis’ Basilica the Dead Christ’s statue will be also carried in the procession. An evocative procession will take place in Gubbio in the Holy Friday’s evening and it is deeply rooted in the 13thcentury: during the celebration, only lit by the torches’ light, the symbols of Christ’s Passion, that is the pictures of Dead Christ and of the Lady of Sorrows, will be carried in the procession, accompanied by two choirs singing the Miserere. The solemn Stations of the Cross will take place in Montefalco, on the Holy Friday, in the inspiring Sanctuary of the Star’s Lady, whereas during the Holy Saturday’s Mass, in the St. Bartolomeo’s Church, you will be able to see a very peculiar event, half-way between the religious worship and the popular tradition: whilst the Gloria will be sung, the 18th century wood statue of the risen Christ will burst into the church, on the shoulders of some running sedan chair bearers, the ostiaries will slam the doors and the church will blaze with light and colours, accompanied by the tolling of bells’ all over the city. Spello will open its doors to art, in order to celebrate the Holy Week, with the Author’s Stations of the Cross: the fourteen stations of the Cross will become a source of inspiration for national and international artists who for the occasion will make paintings to place in the most significative places of the historical center. The stations of the Cross include some stops in front of paintings to listen to the evangelical message of the Risen Christ. An almost theatrical performance of Jesus’ life will take place in Città della Pieve on the Easter Sunday and Monday with the Living Pictures: the traditional performance of Jesus’ Passion, Death and Resurrection will take place in the undergrounds of Orca Palace and will see the participation of about 40 figures. In each hall of the palace you will be able to relive all the steps of Passion, with specific reference to the Last Supper, the prayer in the Getsemani’s garden, the Ecce Homo, the Flagellation, the Piety and Resurrection. You will be able to notice that each scene is inspired by a painting of the Italian pictorial tradition of 16th and 17th century.